I got a stone this morning. Got a stone in my first training battle in the Master League. Together with 500 stardust. Got a stone tonight in my Trainer battle against Spark. Just dust today, but my hubby got a Stone from a Leader Battle yesterday. Just got one from tonight’s round of battles, bringing my total reserve to 9. This is the last time I’ll have a chance at a Sinnoh Stone before Community Day. I had a lucky week, I’d say. These are from Leader Battles only. I’m sitting at 12 Stones right now. Don’t believe I’ll get more until this community day. Did 5 team leader battles today. Got dust on first four, but got a stone on 5th. I forgot that there were five opportunities starting today. Out of my five Leader Battles, I got one Sinnoh Stone. Got Stardust on the others. 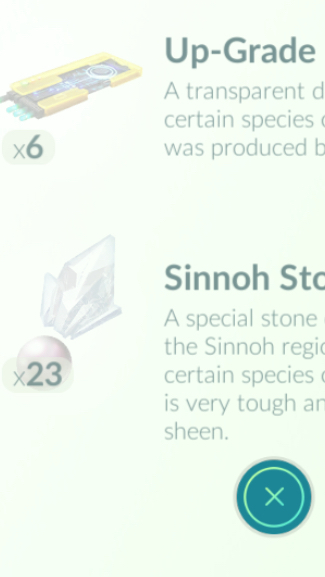 Total of 10 Sinnoh Stones in tow. I thought these 5 opportunities to get Stone from team leader battle starting from Saturday, luckily I read this topic. Five guaranteed Sinnoh Stones is live now for anyone having Community Day on the 16th. I just did mine right after the clock struck midnight. Got all five. I’m ready for Community Day now. Got my 10. Sitting at 18 in reserve. Evolved a Shiny Swinub to get the entries, but I’m more than ready for the rest of the evolutions obviously. I only ended up using 5. I also did another Rhyperior just for fun. Got another one during five Trainer Battles yesterday, bringing my reserve to 19. Got one from a Leader Battle today, first one from that in a long time.